Alyssa is a bright turquoise creme that came out for the summer (July specifically) and it is a perfect polish for warm weather...or those who wish it was still summer *raises hand* It had the usual formula for Julep polishes. I found it to be thick, but not as bad as some Julep polishes, likely because it only needed 2 coats. Carla is a soft pink creme with a really tricky formula and application. It was really thick and streaky, but only needed 2 coats. I personally wouldn't recommend this one since it isn't that unique and has such a tricky formula. Janae is a cool, dark charcoal grey creme. Yeah, this is a crappy swatch, sorry. It is dark, but I could definitely tell it wasn't black. Despite my poor swatches, the formula was not too bad at all. It fully covered in just 2 coats. Juliana is another bright color from July. It's a grapefruit pink with strong gold and pink shimmer. I love pinks and I love shimmer so I really liked this one. It was the sheerest of the 4 and needed 3 thick coats for full opacity. 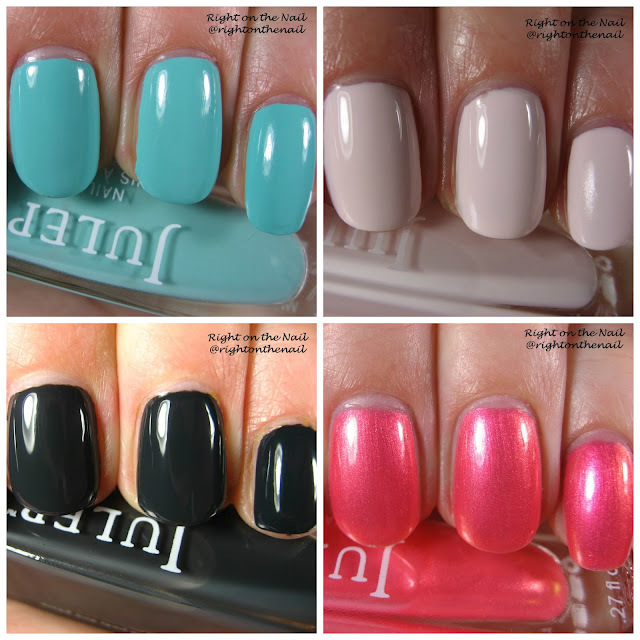 I recently suspended my Julep Maven subscription because I just have too many polishes I still need to swatch. I think Julep polishes are extremely overpriced if you buy they at retail price. If you are interested in any Julep colors, I would recommend just signing up for the Maven box and skipping each month until you find something you're interested in. They will also give you lots of opportunities for discounted mystery bags and special sales.